On December 2, 2015, an American married couple of Pakistani descent (one a citizen, the other a legal resident) named Syed Rizwan Farook and Tashfeen Malik ruined the Christmas party being held by employees of the Inland Regional Center (a not-for-profit organization that assists 33,000 people with developmental disabilities as well as the families of those persons) in San Bernardino, California by crashing the party with guns blazing, killing 14 people and wounding another 22 victims. The couple were killed later in a shootout with police, in which 2 officers were wounded. The couple were considered by government authorities as “home grown terrorists,” and their deadly attack was the worst terrorist attack in the United States since the September 11, 2001 attacks. Syed, the husband, worked for the health department and was born in Chicago, the son of Pakistani immigrants. Tashfeen was born in Pakistan, but had lived most of her life in Saudi Arabia before emigrating to the US. Syed was a graduate of the California State University at San Bernardino and was a “devout” Muslim, going to Mecca for his Hajj and traveling to Saudi Arabia several times. Tashfeen was a graduate of Bahauddin Zakariya University in Pakistan, having studied pharmacology. Tashfeen also studied Islamic religious subjects while in Pakistan and Saudi Arabia. Her “Islamic” education included anti-Western and anti-American points of view. She came to the US specifically to marry Syed, a romance founded on an internet relationship. This is a logo for California State University, San Bernardino. Further details: Seal of California State University, San Bernardino. After marrying Syed in 2014, Tashfeen gave birth to a baby girl 6 months prior to the mass shooting incident. The couple used the birth of the baby as “proof” that their marriage was legitimate in order for Tashfeen to be issued a “Green Card” as a legal resident of the US. Tashfeen took to wearing the traditional niqab and burqa as a sign of her devotion to her religion. After the shootings, it was reported she had been radicalized during both her Islamic education in Pakistan and in Saudi Arabia. Pakistani clerics denied that claim, as did Saudi government officials. American FBI investigation revealed the couple had been radicalized before they “met” on the internet, and had shared communication showing their radicalism for Jihad (holy war). The four guns used by the shooters. Released by the San Bernardino County Sheriff’s Department. Syed was an attendee of the Christmas party and arrived at 8:30 pm, but left early at 10:30, leaving his home-made bomb in his backpack on a table. He returned with Tashfeen at about 10:59 pm and the couple began shooting people. Wearing ski masks and “tactical” gear, the murderous couple fired away, letting loose with about 75 rounds of ammunition in a 4 minute shooting spree before fleeing the scene. Syed’s attempt to trigger the bomb with a telephone failed. Investigators later concluded the attack was only the first of more planned attacks as the extra ammunition and their fleeing the scene would indicate. At the bloody scene 14 people were left dead and another 22 wounded. A party goer had recognized Syed and gave the information to the police. 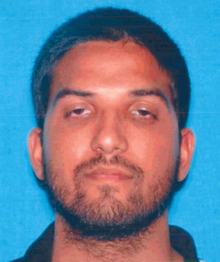 When law enforcement units arrived at the Farook household, the couple fled in an SUV. The chase lasted only 1.7 miles before it ended in gunfire, with 2 officers wounded and both of the terrorists killed. A fake bomb had been thrown at pursuing police during the chase. A knee jerk reaction to the tragedy was of course an enormous wave of anti-gun rhetoric, including comments by President Obama. Calls for “common sense” gun control rang out, but little attention was paid (as usual) to the facts of the incident in which gun laws had been violated and proposed measures would do nothing to stop similar incidents. No gun control advocates pointed out that had any good citizen party goers at the IRC been armed with a legal firearm the attack could possibly have been thwarted with fewer innocent lives lost, a point that usually elicits a fierce reaction from gun control advocates. The San Bernardino IRC terrorist mass shooting and attempted bombing shows how vulnerable we all are to home grown terrorists, legal residents and citizens that become radicalized or mentally ill. Perhaps some method of reporting persons suspected of terrorist tendencies or mental illness with a mandatory investigative procedure could stop some future attacks, but no such mechanism has been proposed or put in place. This incident certainly contributed toward the distrust of Muslims in the United States, exacerbating an already touchy relationship between American Muslims and American non-Muslims. A year after the shooting, Donald Trump ran for President and played a strident tune of anti-Muslim oratory all the way to the White House. Trump and supporters attend a rally in Muscatine, Iowa, in January 2016. Questions for Students (and others): How could the San Bernardino mass murder have been stopped before it started? Should any of the (non-drinking party goers have been armed? Should Muslim Americans be “profiled” and under surveillance by law enforcement authorities at all times? Should any group of people be blamed for the sins of a few of their number? How would California gun control laws have made the situation better or worse? Alexander, DE and Sol Adoni. San Bernardino Terrorism Conspiracy. Adoni Publishing, 2015. Spitzer, Robert. The Politics of Gun Control. Amazon Digital Services, 2017. United States Department of Defense. The Homegrown Jihadi Terrorist: The Threat of ISIS-Inspired Radicalization in the United States – American Foreign Fighters for Violent Islamist Extremism, Minnesota Cluster and Game Theory Analysis. Amazon Digital Services, 2018. The featured image in this article, a photograph of the shooters’ Ford Expedition SUV, involved in the shootout, released by the San Bernardino County Sheriff’s Department from https://www.independent.co.uk/news/world/americas/san-bernardino-shooting-attackers-modified-weapons-to-make-them-more-deadly-a6761566.html (http://img.thesun.co.uk/aidemitlum/archive/02589/SanBernardino_04_2589795a.jpg) was created by a government unit (including state, county, and municipal government agencies) of the State of California and is subject to disclosure under the California Public Records Act (Government Code § 6250 et seq.). It is a public record that was not created by an agency which state law has allowed to claim copyright and is therefore in the public domain in the United States. County of Santa Clara v. CFAC held that the State of California cannot enforce a copyright in any record subject to the Public Records Act in the absence of another state statute giving it the authority to do so. Note: Works that are considered “public records” but were not created by a state or municipal government agency may be copyrighted by their author; the Supremacy Clause of the United States Constitution prevents state law from overriding the author’s right to copyright protection that is granted by federal law. For example, a state agency may post images online of the final appearance of a building under construction; while the images may be “public records”, their creator (eg. architecture/construction firm) retains copyright rights to the image unless the contract with the agency says otherwise. See: Government-in-the-Sunshine Manual: To what extent does federal law preempt state law regarding public inspection of records?.